The wireless sensing stations installed at Camalie Vineyards are capable of relaying data on soil moisture and soil temperature so that the vineyard manager may review how the various zones are performing. Wireless sensor networks can reduce water and energy consumption while increasing yield and improving quality. The versatility of the transceivers and sensors allows vineyard managers to track soil moisture, temperature, humidity, the amount of water that flows to each vine across the same network and, in the cellar, rate of fermentation. 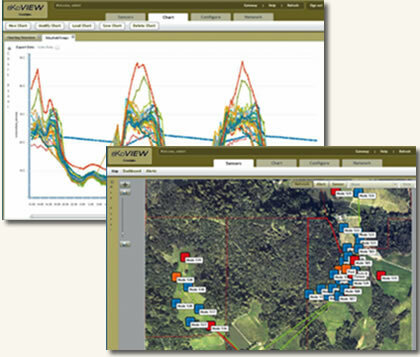 The network's simple but powerful design can help vineyard managers develop a comprehensive vision for how to operate their vineyards more efficiently. Mark Holler, viticulturist and one-time technical director for Intel's neural network team, installed one of the industry's most sophisticated tools for measuring soil moisture in his Northern California vineyard. He collaborated with Dr. David Smart from the University of California, Davis; Dr. Alan Broad from Crossbow Technology, and Cindy Bickerstaff of Holler's offshoot company, Camalie Networks, to build a wireless sensor network that reduces water and energy consumption while increasing yield and improving the quality of his grapes. The simple but powerful design can help vineyard managers develop a comprehensive vision for how to operate their vineyards more efficiently. Like neurons--those wiry cells that transmit electrical signals through the nervous system--field nodes send sensory data to a gateway node in staccato-like bursts. These sensory nodes contain a micro electro-mechanical array for measuring a vineyard's vital signs, a microprocessor for gathering data, and a low-power radio for relaying information to a web server that dispatches data via the Internet to a laptop or desktop computer. Vineyard managers can review information about the health of their vines by typing an IP address or user name into a web browser to locate the network's home page. 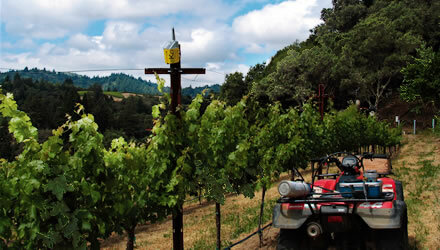 Holler began collecting field data at Camalie Vineyards in 2003 from a fixed weather station equipped with three soil moisture tensiometers. He determined that a single site could not capture enough information to manage six vineyard blocks that sprawl across the western slope of Napa Valley. With several microclimates and soil types to monitor in his Mount Veeder vineyard, he installed four motes, or wireless sensing stations, during the spring of 2005 to gather information, process data and transmit it to his desktop computer. "Soil-moisture monitoring has been invaluable in improving crop yield and quality." Surrounded by a redwood forest and oak woodlands, the 4.5-acre vineyard occupies 10 areas that Holler defines by their unique combination of soil, exposure and climate. "A soil gradient cuts across the vineyard," he says. "Some blocks, which are sandier and more exposed, dry out faster. Others, which are composed of heavy clay and more protected, hold water longer." Today, Holler can map the resource requirements for his vineyard by harnessing a lifetime of experience to the latest wireless sensor technology. He also started a business, Camalie Networks, with Cindy Bickerstaff, to help other growers use the technology. Like many viticulturists for wineries across much of the western United States, Holler faced an especially dry spring and summer in 2007. Sixteen inches of rain fell on Mount Veeder during 2007, compared to 40 inches of precipitation in 2006. But Holler insists that his vineyard produces its highest quality grapes when he stresses his vines to the limit by rationing irrigation water. After Holler broadened the reach of his wireless network from four to 10 portable transceivers last year, he correlated the midday leaf water potential for Cabernet Sauvignon vines to the soil moisture tension for each microclimate and soil type found in his hillside vineyard. He calibrated the more efficient, less costly soil moisture measurements with the leaf water potential values to manage deficit irrigation. As his confidence in the correlation grew, he migrated from leaf water potential to soil moisture measurements. By holding the soil moisture corresponding to the leaf water potential for the RDI (regulated deficit irrigation) threshold, he reduced the amount of irrigation water for the 2007 growing season by 26% while doubling the yield of his 4-year-old vines. During the 14 weeks of the irrigation season, Holler pumped 124,000 gallons of pond and well water and 25,000 gallons of city water to his vineyard to retain the most productive soil moisture for his four acres of Cabernet Sauvignon vines. "You better believe that I wasn't trucking in any more water than I had to," Holler says. "Knowing the exact soil moisture at 10 locations meant that I did not have to purchase any more water than absolutely necessary." These prototypes of the field nodes that he installed in quantity this spring transmitted soil moisture and temperature data to a web server along the path of least resistance. A self-organizing mesh, its neuron-like nodes fired data rhythmically along an electronic pathway accounting for every transceiver or cell in the network. Had a tractor flattened a node, the network would have re-routed the signal around the damaged cell. "Soil-moisture monitoring has been invaluable in improving crop yield and quality," Holler says. "We grew 3.9 tons of Cabernet Sauvignon grapes per acre by irrigating each vine with just 34 gallons from June until harvest. "The last 4 tons of grapes came in at 27° Brix, a good indicator of mature fruit with limited dehydration," he says. "In 2007, we produced our best yield and highest quality grapes to date." An early graph from the prototype network of Camalie Vineyards' viticulturist, Mark Holler, charts soil moisture data at three locations in the vineyard during the 2007 growing season. Raw voltage from the measurement circuit is measured in thousands of millivolts. Holler says: "Higher equals drier." Besides measuring soil moisture and temperature, Holler has explored a number of other useful applications for the wireless network. "If you have a hammer, everything looks like a nail," Holler explains as he reaches for a pressure sensor connected to the base of a 66-gallon stainless steel fermentation tank. Replacing a hydrometer, the $14 pressure sensor gauges the weight of the must as CO2 evolves. A field node equipped with an A/D (analog-to-digital) converter captures the pressure signal as well as the cap temperature and transmits it across the network to the database and then his desktop computer, where they appear instantaneously as data points on a two-dimensional graph. Holler has placed a node for recording air temperature in his cellar, and will add a humidity sensor to the network next year to alert him how often to top-off the barrels. While measuring soil moisture, temperature, humidity and rate of fermentation remain important applications of the network technology, Holler also has found ways for the wireless sensor network to control the amount of water that flows to each vine. moisture climbs up a wick suspended in the tank," he says. "The wick exhibits the same capillary rise of water against gravity that occurs in the soil." He also can track the flow of water delivered to vines for each vineyard block by measuring the pressure before and after the main filter at the irrigation manifold. Electronic pressure sensors report data to the desktop computer. Measuring the pressure before and after the main filter at the irrigation manifold allows Mark Holler of Camalie Vineyards to track the flow of water delivered to vines for each vineyard block. Holler spends part of the week in Palo Alto--some 86 miles from his vineyard--where he often discovers changes in operations before anyone else. "Last September, while pumping trucked water up to a storage tank, the increased water pressure popped an old cast-iron pipe," he says. "The network alerted me before the vineyard manager did." This spring, Holler introduced the latest sensor technology, the eKo Pro Series solar-powered wireless sensor network from Crossbow Technology. He expanded his network from 10 to 26 sensory nodes, and coverage from 700 feet to more than a mile from the gateway node. Twelve of these field nodes cover 18 acres of neighboring vineyards. Each field node will connect to a temperature sensor and moisture sensors that are 12, 24 and 36 inches deep. hopes to combine a conductivity sensor with a soil moisture tensiometer to determine how quickly plants absorb fertilizer. "Canopy temperatures are another indicator of stress that we could easily integrate into the network," he says. "Precision agriculture is the opportunity to use resources such as water and agricultural chemicals more judiciously with the same results," says Dr. Michael Delwiche from the Department of Biological and Agricultural Engineering at UC Davis. 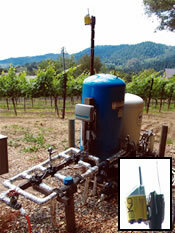 Delwiche has studied wireless irrigation and fertigation in nurseries, hot houses, orchards and vineyards. "We want to manage irrigation so that we can bring crops to maturity in a uniform way," he says. Data gathered from wireless sensors placed around the vineyard allow growers to make decisions about irrigation and temperature control that are specific to each quadrant or microclimate. Several sensor companies have created tools to help vineyard managers gather data from their fields at a time that soil ecologists describe as a new era for soil science. The notion that vineyard managers feed the soil, not the plant, has grown beyond a nucleus of researchers. Scientists have combined sensor technology, global positioning software and hardware to map the physical and chemical characteristics of the vineyard. Vineyard managers can review soil profiles and contour maps on the consoles of their computers to help them evaluate the variability of the depth, pH or texture of the soil, for example, and its capacity to hold water. Engineers have added wireless sensing stations to gather information, process data and send it to a computer in the field house or an office halfway around the world. Solar-powered motes collect soil data, convert it to an electronic signal and transmit it to the Internet, where vineyard managers can review data as easy-to-read graphs. They can retrieve information as well as transmit commands. Once the vineyard managers have evaluated the data, they can direct a wireless sensor located in the vineyard to open an irrigation or fertigation valve. The breadth of technology ranges from a hand-held soil moisture probe to a wireless mesh that gathers and transmits data across acres of vineyard. Companies that manufacture and sell these devices include those listed at right. Based in Silicon Valley, Thomas Ulrich has written news and feature stories for Time magazine, the Christian Science Monitor and the Washington Post. He teaches journalism at San Jose State University. I would be happy to answer any questions you might have. My contact information is mholler@pacbell.net and my cell number is 650-799-6571. Hope you enjoyed the article.